Since 1990, Retro 51’s mission has been to design and manufacture pens that bring fashion, fun, and value to the consumer. Today, they have become one of our most popular brands by new and old collectors alike. Their pens have the look and feel of writing instruments of the past, yet incorporate all of today’s technology. In 1997, Retro 51 released their Tornado collection and today most of the top sellers are part of this collection. 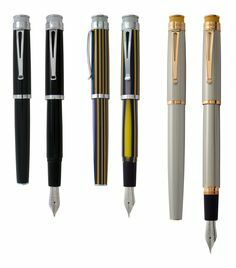 Originally they were only available in ballpoint but now they also feature rollerballs, fountain pens, and pencils. In addition, they also come in different widths so it’s easy to find one that feels right to you. The best parts of the Tornado line, though, are the limited edition pens. These pens are so special because only a small amount is produced, and they feature themes such as animal rescue, medicine, and American history. Be warned though, once you start collecting you will want them all! Make sure to check our site for the newest models. In addition to selling their pens, we also stock a selection of Retro 51’s accessories. Their desk sets give a touch of class to any work area and are great for wedding books. We also stock their stands and trays for displaying your favorite pens. Lastly, need a refill? Then Executive Essentials is the one-stop shopping for all your ink and eraser needs. The best part of collecting Retro 51 pens is how affordable they are. Most of the pens start at under $50 and many are priced at only $20. You will be amazed at the quality you are getting for that price. So, go ahead and splurge without feeling guilty. We promise not to tell. Everything seems to be getting smaller these days, and this includes briefcases. However, if you work in a paper-dependent profession, you might feel left behind. The good news is that catalog cases (also sometimes called sample cases) are still around and there are still many options for you to choose from. The first choice to make is wheeled or a non-wheeled catalog case. Most cases are wheeled, but a few options for a non-wheeled still remain. The only reason to do a non-wheeled case is just personal preference, for most people the wheeled cases are better due to the weight of the paper. The second choice is materials. The main three materials are nylon, vinyl, and leather. Nylon holds up the best over time, vinyl gives a leather look with more durability, and leather gives a rich look that can’t be beat. Once you decide on your material the next decision is if you want an 18’’ or 20’’ and what kind of pocketing you are looking for. Most catalog cases have a front pocket to put your small items in and have a place for a laptop computer. Some even have side pockets. Also, almost all catalog cases have combination locks built in, but once in a while they don’t so make sure your case has it before you buy. Before you use your new catalog case make sure to pack it how you are going to use it and try wheeling it around the house. Make sure that it fits everything you need and feels comfortable to walk with. If you are using it outside in the snow make sure to give the case a wipe down every so often and oil up the wheels, because the road salt does dry things out. Taking good care of your case will allow it to have a dependable life. Timbuk2, a city in the Tombouctou Region of the West African nation of Mali…no that is Timbuktu; Timbuk2, a San Francisco based messenger bag company started in a garage, in the 1980’s…yes, that is the Timbuk2 I am talking about! Who made the first messenger bag? New York based company Globe Canvas for telephone linemen. However, New York City bicycle messengers soon realized the benefits of the design, and Globe Canvas “messenger bags” were soon spotted all over town. Timbuk2 wasn’t far behind, and they soon began to capture the hearts of mainstream America. People walking down the street noticed the brightly colored, well-made bags, and wanted them for themselves. Along with all Timbuk2 bags, these are both made of rugged ballistic nylon, heavy-duty stitching, and waterproof liners. Each bag comes with a padded adjustable shoulder strap, and many organizational features like a key ring tether. While the messenger bags share many desirable features, they also have characteristics that make each unique for the particular needs of their owners. Check them out at Executive Essentials!